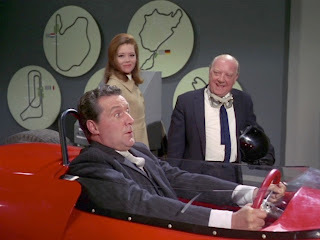 50 years ago the very first episode of The Avengers was transmitted. Hot Snow, shown on the 7 December 1961 and introducing Ian Hendry as Dr. Keel and Patrick Macnee as John Steed, doesn't really give much of an indication as to how The Avengers would become the ultimate expression of Sixties pop culture and a global television phenomenon. Those early episodes are gritty, hard-nosed thrillers and I've already covered Optimum's DVD box set releases of Series One & Two, Series Three and Four back in 2010 and 2009, charting how this black and white thriller blossomed as the decade moved on, and how, as James Chapman noted in his essay in Windows on the Sixties, "The Avengers both defines and is defined by the 1960s [and reflects] the social changes taking place in Britain during the period" and is a barometer of the "the technological changes that occurred in the television industry moving from 'live' performance to film, and from black-and-white to colour." 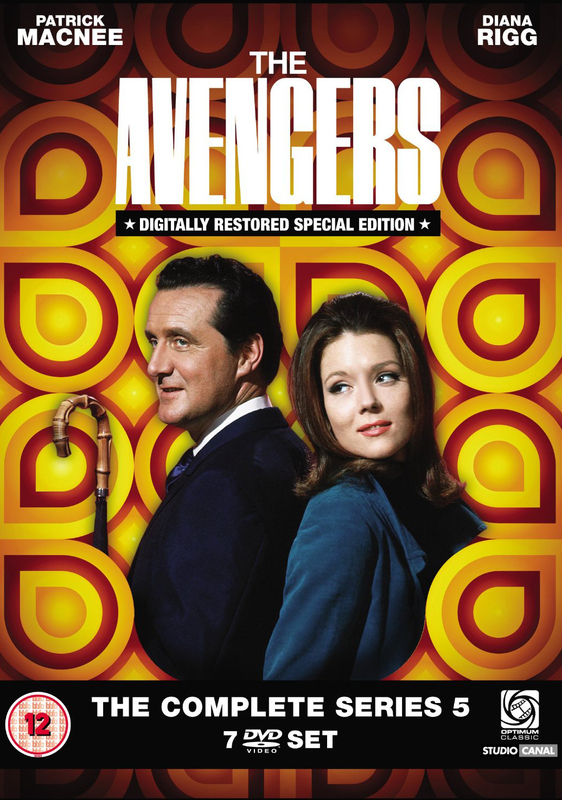 And with Series 5 we do indeed move into colour, heralded with a caption card 'The Avengers in Color' on each episode as required by the American network ABC who had paid the then-unheard of sum of $2 million for the first 26 episodes and made the series one of the first, if not the first, British series to be aired on prime time U.S. television. Series 5 takes the fantasy elements prominent in the first Rigg series and exaggerates them with the use of full colour, high-fashion elements (including costumes for Rigg and Macnee designed by Alun Hughes and Pierre Cardin), a bevvy of prominent British character actors playing a wealth of eccentrics and diabolical masterminds and a knowingness about the relationship between the television audience and the programme itself. 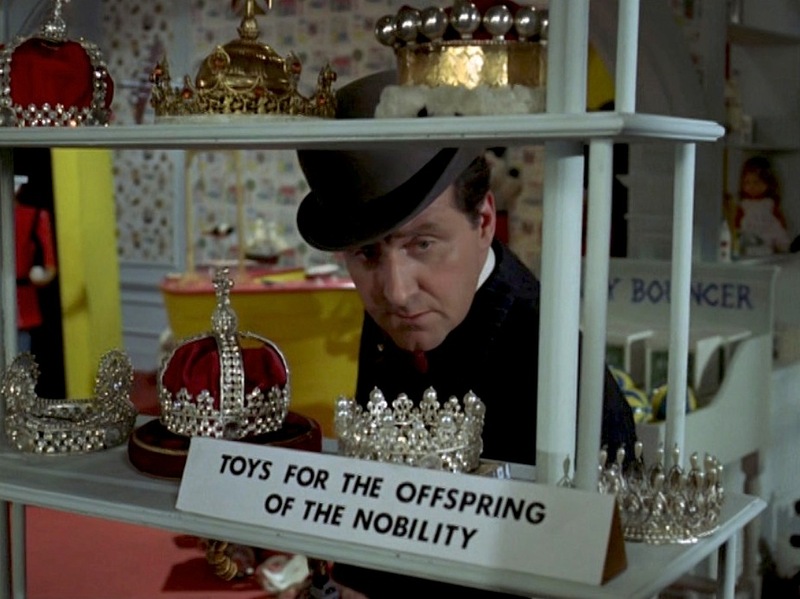 This knowingness is present both in the number of attempts to break the fourth wall by the leading actors, with asides and direct looks down the lens, to the manipulation of artifice and surface, in set design and narratives that pull apart and glorify the very idea of making films and television programmes. It's very much Clemens and his production team emulating the progress that a director like Federico Fellini was making in his own work in the late 1960s. The Fellinesque qualities of stories such as Epic, Escape in Time and Something Nasty in the Nursery suggest a pop-art style married to increasingly metatextual narratives that comment on the art of storytelling and film-making within the contrived nature of 'Avengersland'. 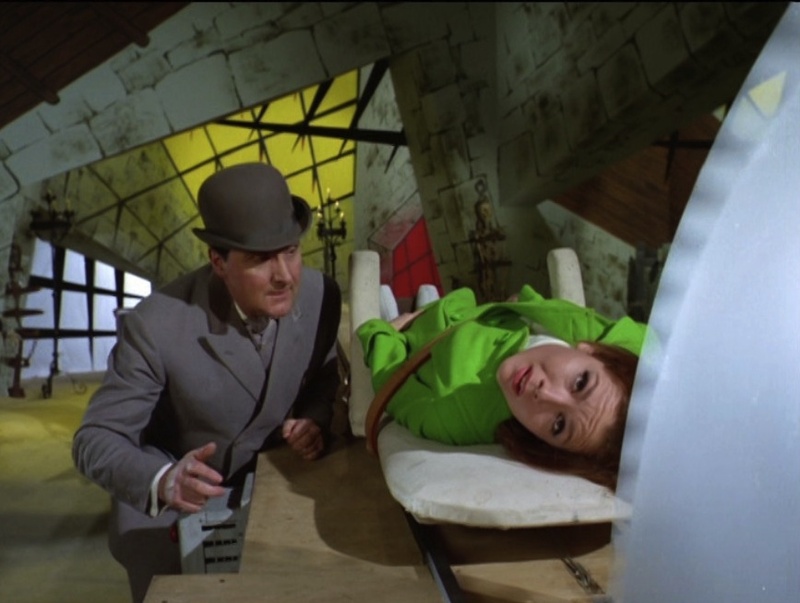 'Avengersland' is a construction that Fellini would have been proud of and depicts an England of the mind, of the imagination, where increasingly during Series 5 the threats to Steed and Emma become more and more artificially generated. As I discussed in my review of Spirits of the Dead, Fellini's section of that film is about the audience understanding that Terence Stamp's character exists in a knowingly artificial world. 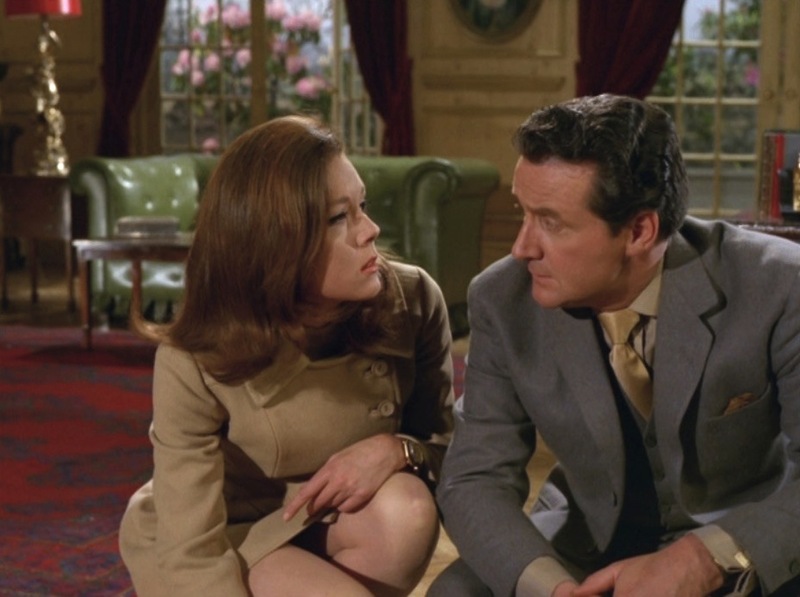 Much the same occurs in Brian Clemens concept of The Avengers. 'Avengersland' is therefore postmodernist in nature, and Christopher Sharrett, in commenting on Fellini's work from Spirits of the Dead onwards has called this effect "the sum and substance of postmodernity [where] the piling up of signifiers merely creates new attractions and commodities" and where, by extension, the colour episodes of Avengerland are created "by removing [them] from all social/political/economic context." 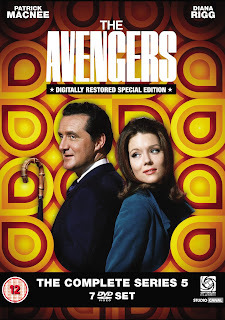 This self-evident awareness of its own construction, of the tropes that it uses, marks out the first colour series of The Avengers and is later developed into the Thorson series. Where the previous Rigg series had been 'Britain versus the world' it is worth noting that by 1967 this had shifted to 'Britain is the world' in the colour episodes and was very much in line with London being regarded as the epicentre of the late 1960s explosion of pop, architecture, fashion and design and The Avengers own nostalgia for a non-existent version of England where the troubles of the modern world are eradicated by a desire to recreate Edwardiana via glossy Hollywood pastiche. 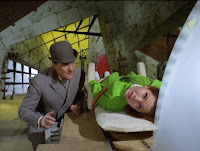 Science fiction and fantasy rub shoulders with the series's own comedy of manners and sense of British fair-play, epitomised in everything from the tag sequences, the 'Mrs. Peel We're Needed' introductions and the witty captions that summarise each episode to the gaggle of malcontent British scientists, astronomers, executives, aristocrats, ministers and secret agents who believe they have been treated unfairly in the rush to embrace the 'swinging sixties' modernisation of the nation. From Venus With Love - its obsessions about alien invasion from Venus and the deadly threat of laser weapons jostle with a comedy turn from Jon Pertwee and a stylish cameo from Barbara Shelley. Escape In Time - an utterly surreal story about a man who provides a service to criminals that allows them to escape from the authorities into any part of past history. Superb guest cameo from Peter Bowles and filled with massive chunks of gaudy, dream-like visual/physical comedy that divorces the series entirely from any reality. Looks stunning in its restored format here. The Winged Avenger - a clever mix of thriller, comic book (the legendary Frank Bellamy supplied the comic strips for the episode) and a tongue in cheek and metatextual nod to the Adam West Batman series in Steed's showdown with the villain where he clouts him over the head with Roy Lichtenstein inspired pop-artwork declaring 'Pow!' 'Blam! and 'Splat!' Another sequence where live action flips back and forth with comic book recreations was way ahead of its time. 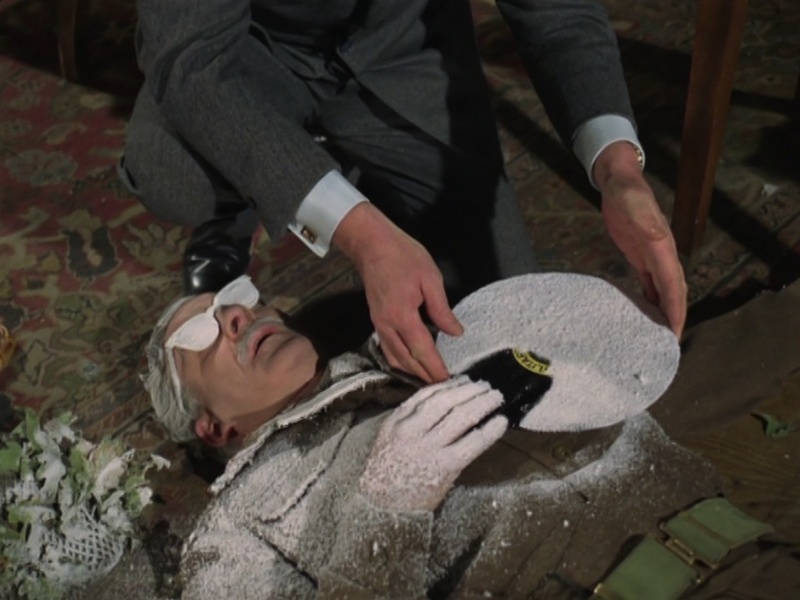 Never, Never Say Die - a pastiche of the Frankenstein story with a great guest performance from Christopher Lee. Epic - stunningly restored here and a wonderfully surreal blend of Sunset Boulevard and Fellini's 8½, thoroughly divorced from realism and driven by completely glorious performances from the triumvirate of Peter Wyngarde, Kenneth Warren and Isa Miranda. Something Nasty in the Nursery - more surreal and nightmarish imagery that twists childhood memories completely out of shape. It's a very knowing episode that allows the audience in on the artificiality of the storytelling. Who's Who? 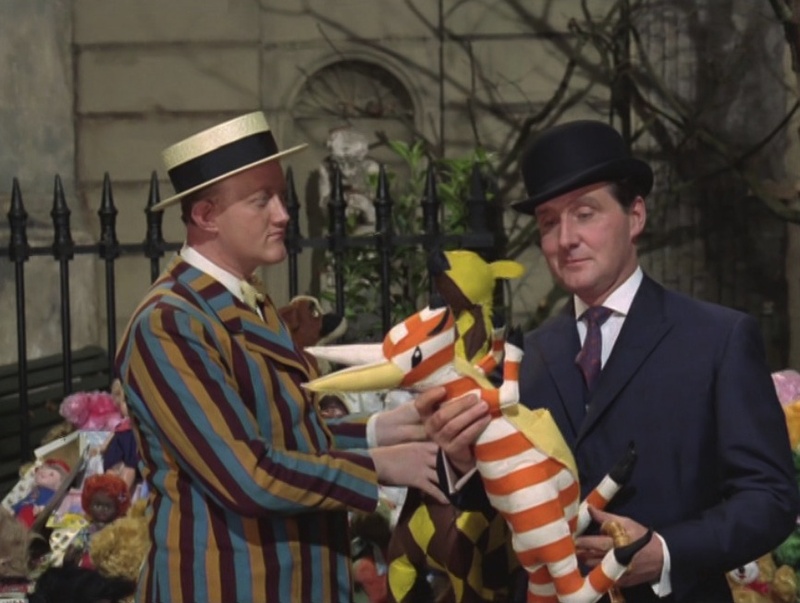 - great fun in that it allows Macnee and Rigg to stretch and play against their characters and it features an equally sensational double-act in Freddie Jones and Patricia Haynes as the agents they swap bodies with. The ad-breaks are structured to feature a very tongue-in-cheek recap for the audiences as to who is exactly whom as the story continues. 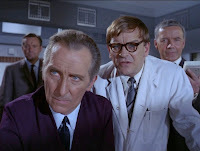 Return of the Cybernauts - Peter Cushing is sublime as the villainous Paul Beresford, and the story is unusual in that he is actually a friend of Steed and Emma's and there are undercurrents of jealousy from Steed when Paul gets very enamoured of Emma. Dead Man's Treasure - glorious romp combining a treasure hunt, a cross-country car chase that showcases the English countryside at its most beautiful, a deadly racing-car simulator and Laurie Johnson's bouncy incidental music. 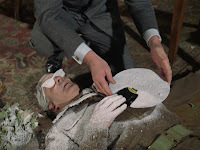 The Positive-Negative Man - more surreal, comic strip inspired material successfully blended with an espionage thriller and featuring Ray McAnally at roughly the same time he went on to make the sublime Spindoe for Granada. The quality of the image here is again very good and with many episodes it is truly sensational, with vibrant and exceptional colour and contrast that show off the gorgeous sets and location shooting and often revealing fine detail in faces and costumes. These are blemish free digital masters, exquisitely restored but there is a noticeable shift in the quality of cinematography between the earlier and later episodes in the production run. Certainly the contrast and colour fidelity isn't as robust in The Fear Merchants for example but I would put that down to the way it was shot rather than a fault of the restoration. The restoration is of such good quality that it simply begs for a Blu-Ray release in high definition and I hope that Optimum will be looking to achieve this in the next year as I think these will look particularly stunning in HD. The highly effective and memorable music from Laurie Johnson is well represented on the soundtrack but alas, there does seem to be a problem with the sound mix. 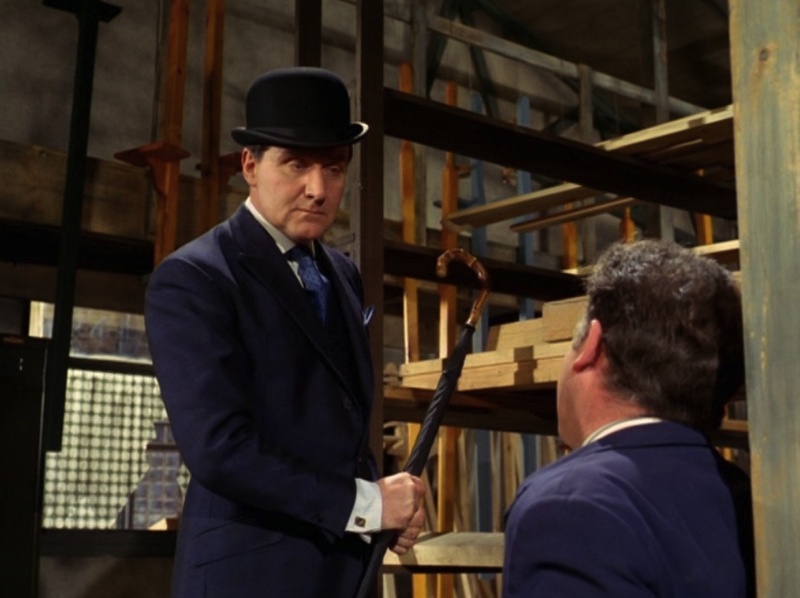 It is obvious that the vocal track is slightly speeded up and is particularly noticeable with male voices, especially Steed's, which are pitched slightly too high. Optimum have already been made aware of this and are offering replacement discs for this set. A real shame that problems like this are not being identified by the company's own quality control department. It's a blemish on an otherwise fantastic DVD set. 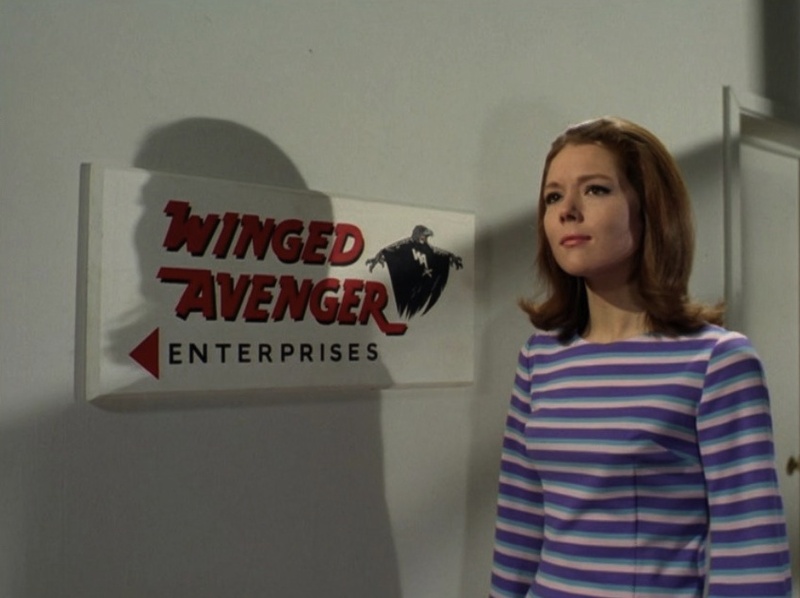 The commentary to The Winged Avenger, moderated effectively by Jaz Wiseman, covers writer Richard Harris's contribution to the original black and white series of The Avengers and the comic book influences that went into the creation of his script for the colour Rigg series. The chat is interesting and informative and very much focuses on his career as a writer, including his work on the Hancock scripts for ATV and developing Man in a Suitcase. Perhaps the stand-out commentary on this set has to be from the legendary Peter Wyngarde on the episode Epic. Wyngarde is clearly not that concerned about remembering the more intricate details of the episode (although he dedicates it to colleagues James Hill, Isa Miranda, Kenneth Warren and Albert Fennell) but goes on to regale us with tons of anecdotes about his theatrical career, working with Ralph Richardson, and breaks off to put in a performance as George Sanders and later recites various songs and poems. A true 'luvvie', bless him. Stunt artist Cyd Childs and writer/producer Brian Clemens also offer interesting stories and anecdotes on their own commentaries for, respectively, Return of the Cybernauts and Murdersville. An essential purchase but marred by that sound fault so proceed with caution and check that Optimum are still replacing the erroneous discs and replacing stock in stores.